A delegation led by UCL’s President & Provost, Professor Michael Arthur, visited key university partners in Rome this week, including La Sapienza, Italy’s largest university. 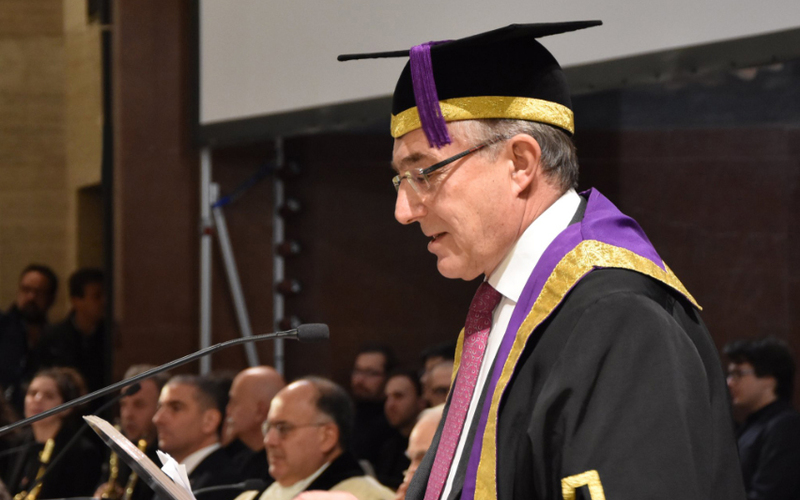 The Provost was the principal foreign guest speaker at a public ceremony to inaugurate Sapienza’s new academic session. The Provost and the Rector of Sapienza University also met separately to discuss bilateral collaboration, including student mobility, between the two institutions. The visit provided a great opportunity to profile the launch of UCL’s Cities partnerships Programme (CpP) in a broadly pro-EU setting, in the presence of very senior guests, including the Prime Minister of Italy, Giuseppe Conte, two former prime ministers, numerous cabinet ministers and more than 30 rectors of national universities across Italy. Launched internally in November 2018, the Cities partnerships Programme is designed to support and increase the impact of academic collaborations with partners in major cities around the world, starting in Europe (because of Brexit). Rome is the first city to host the programme. Professor Arthur was joined by Dame Nicola Brewer, UCL Vice-Provost (International), Professor Stella Bruzzi, Executive Dean, Faculty of Arts and Humanities at UCL, Dr Uta Staiger, Pro-Vice-Provost (Europe) and Executive Director of the European Institute at UCL and Dr Florian Mussgnug, Academic Director for the CpP (Rome) and Reader in Italian and Comparative Literature at UCL. The delegation also met with Roma Tre University, another key university partner in the CpP, signing a new Memorandum of Understanding to support further collaboration between the two institutions, including student mobility. This year, over 25 new projects representing every faculty at UCL will receive funding through the CpP, the first cycle of which is led by Dr Mussgnug. The projects span many disciplines and include investigations of sensory systems, political speech-making, technologies of the future, migration, health economics and urban governance and design. This marks the first year of three years of seed funding calls for the CpP in Rome. In future cycles of the CpP it will support academic collaboration in and around three cities simultaneously and will launch in a new city each year. Paris will be the next city to host the programme, which will be led by Dr Claire Colomb from the Bartlett School of Planning.